I’m sure we have all heard these words before. Maybe you were the one to utter them. Maybe when you were the one who said these words, you truly meant them – at the time. Maybe you didn’t. Maybe when you heard these words, your entire world came crashing down. Maybe you thought you were in love. He was the one. She was my girl. They were the ones. We cannot commit. We cannot fully be with just one person. We struggle. We struggle to make that person our everything. Our one and only. We constantly want more. We are on a continuous search for something better. Someone better. The best. We have too many choices. Too many options. The choice is ours, but we cannot decide. We think we have, but we really haven’t. We cannot commit. We don’t fully see the point. We are aware that our options have no limits. We spend our lives chasing after them. We struggle, but we try. We lead filtered lives, with everything at our fingertips. So close, but so far. We live our lives for likes, comments, shares. We think followers are friends. We swipe right, unmatch, unfriend. We think that our 140 charactered tweets are enough – but it is not. We have forgotten how to show respect. We have forgotten how to be respected. To be truthful, how to be faithful and loyal. We don’t know the real feeling of safety or security, but instead become accustomed to our insecurities, our lack of self respect, the invisibility of our morals and the non existent levels of our integrity. All in all, we have forgotten how to love. We want to be loved, but we don’t love ourselves. We don’t know how. We believe “love” to be a like, a comment, a share. But that is not love which we advertise. That is attention. Nothing but attention from our filtered lives. We will always have a wandering eye. An eye for something better. We allow cheating, swearing at one another, slamming of doors, and shouting. We become the girl who he cheated on her with, the person who swore at the other first, the one who slammed the door. We see it as okay. But it is not. We think we can ‘try again”, “move forward”, “get through it” and “start over”, but we cannot. We begin to think that we can fix things. We think it is okay to apologise over Whatsapp, an E-mail or an Inbox. But it is not. We think that “trying again” is an apology to one another, because you both finally understand where you went wrong. We tell ourselves that we both deserve a second chance, but we do not. You see, we don’t know the true meaning of love. We want to be a part of it, but we don’t know how. In the back of our minds, we will constantly wonder if our partners might find someone better than us. Someone who could love them more. A person who could make them feel more beautiful than what we can. Someone who could make them feel worthier than what we are capable of. We fear, so we try harder. We filter even more. Pose more. We pretend. 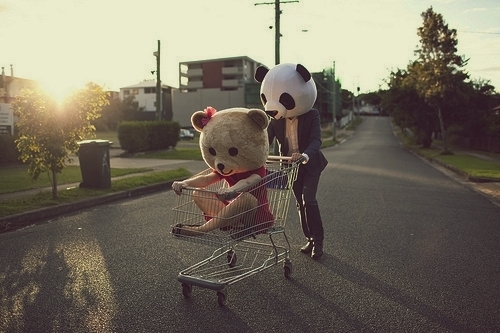 We pretend because we want to seem as “happy” as every other couple out there. We don’t want to fail. We want to fit in. We forget that behind the “happy” filtered life, behind all the hashtags and likes, we are all just human beings. Human beings that want to love and be loved. Human beings that want to do the best that they can for their significant other. We are human beings that want to be happy and feel appreciated. Without appreciation, we cannot be the best that we can be. We cannot be our full potential. We are all the same, but we struggle to realise. We are “not ready” to be in a relationship because we have forgotten how to feel. We are taught what love should be like, but forgotten how to feel. We are taught that love is intimacy, but we’ve lost that. Love is passion, understanding, and support. Love is kindness, joy, and respect. Love is loyalty, but we’ve lost that. We struggle to open ourselves up to people. We cannot explain how we feel. We cannot seem to find the words that we want to say. We lack communication. We are scared of rejection. We stay with the person who won’t commit to us or go back to the person who once cheated, because it is routine. It is comfort. We might lust for someone else, but we stick with our comfort. We need to learn how to stop making excuses. We need realise that we only allow what will happen. We are to blame. We need to overcome our fear of rejection and speak out. We need to communicate. Far too often we assume. Assumptions are only part of self communication. We need to realise that there is more to life than a voicenote, than emoticons, a selfie, a status, or a hashtag. We need to realise that this is not communication. We find comfort in our likes, comments and shares. We think it is support. But it is not. We should not allow ourselves to be strung along on the side. We should have enough self respect to know that we deserve better. We all deserve the best. We need to communicate. We need face-to-face interactions. To look further than our touch screens and explain what it is that we want from the other person. We need to realise that we ourselves are enough. We need to learn how to love ourselves. We need to become the masters of our own unconditional love, because without that, we will never truly have each other. If, for some peculiar reason, you have ever wanted to be a walking Turkish Delight advert, frolicking your way down the streets of the city this Summer, then I have JUST the solution for you. 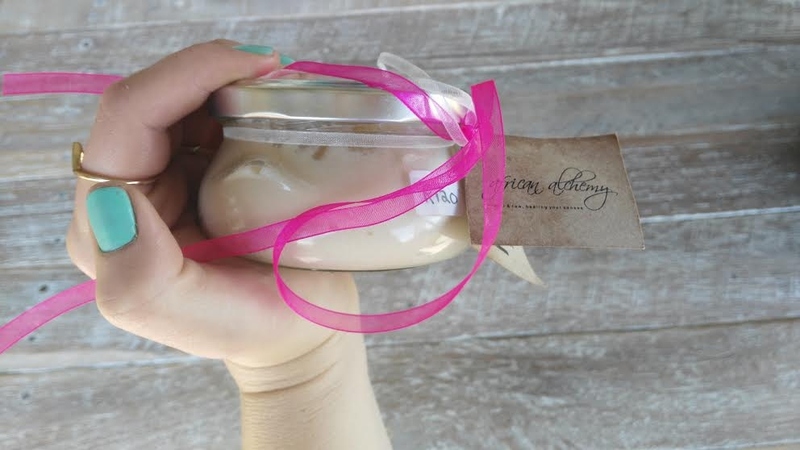 Prepare to smell like the sweetest Petal in Town with the ever so delicious scents of the African Alchemy Body Butter. 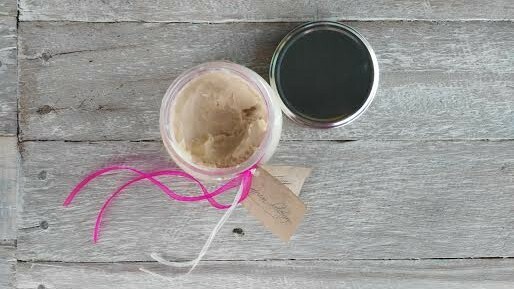 Hints of Cocao butter, Coconut oil, Cold pressed Almond oil, Rose geranium and Sandalwood essential oils come out to play releasing an overall scent of Summer sweetness and absolute deliciousness – almost good enough to eat!! All together, one can expect to smell like the Dandiest of Delilahs, radiating fragrances of Calming Cocoa, Turkish Delight and subtle hints of our favourite Anonymous Almonds make an appearance too. 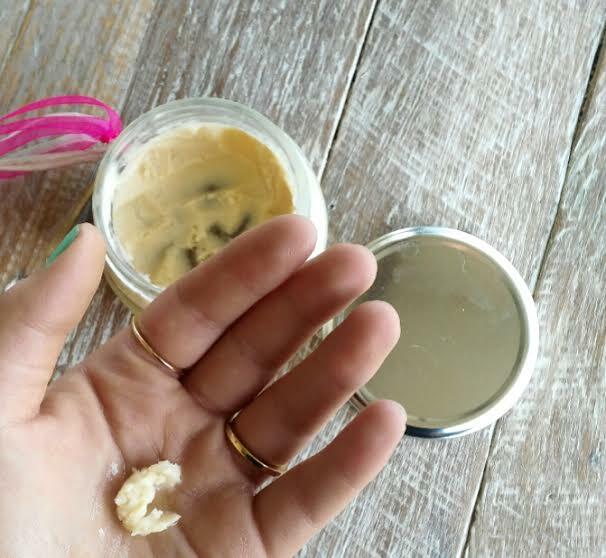 If you are a Natural Netty and are in awe of organic products, then I’m ecstatic to tell you that this Body Butter is not only that, but is also raw AND cold pressed!! Such Pure Indulgence if you ask me!! When initially dipping ones paws into this tub of bliss, feelings of soft bubbliness with a light airy texture can be felt on the fingertips when going in for a scoop. A small bit goes a long way and is seemingly fit enough to spread across a mile. 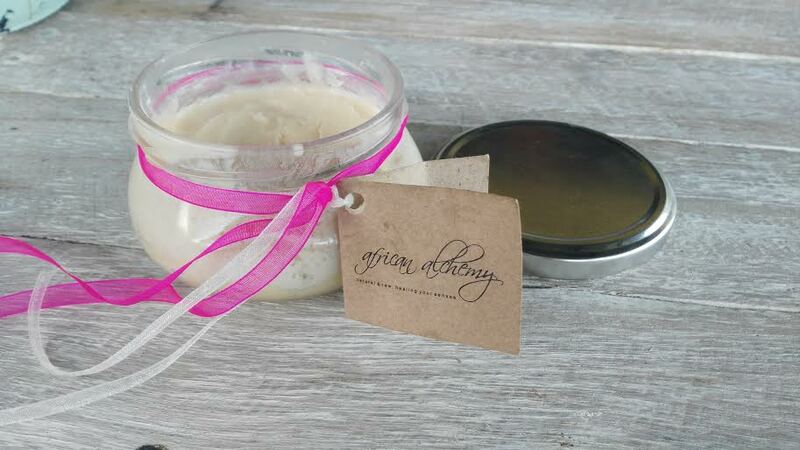 I bet you’ve never come across a body butter as fit as this one! As with any other form of butter, spreading is a relatively smooth process when involving such acts over our ever so precious bodily limbs. Buttercup looking radiant!!! 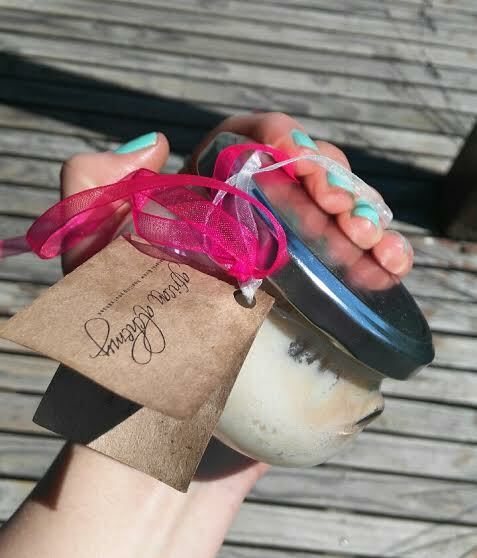 Adopt a tub for R120 at your local Paardevlei Farmers Market in Somerst West on Saturdays from 9am-2pm!!! Moisturisation Station is a somewhat friendly stop as it does just that, and does not over extend its skills in such departments. Absorption is super well mannered and happens relatively quickly. Luckily for you, being a visual replica of an oil slick is not in the cards when using our Tantalising Turkish friend, as one is left with a gorgeous revitalising glow. 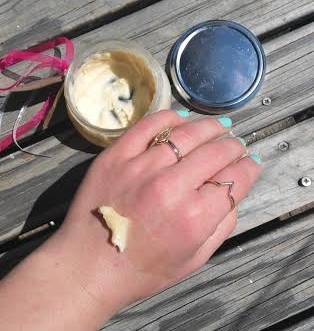 How lovely and perfect for highlighting that summer kissed skin! 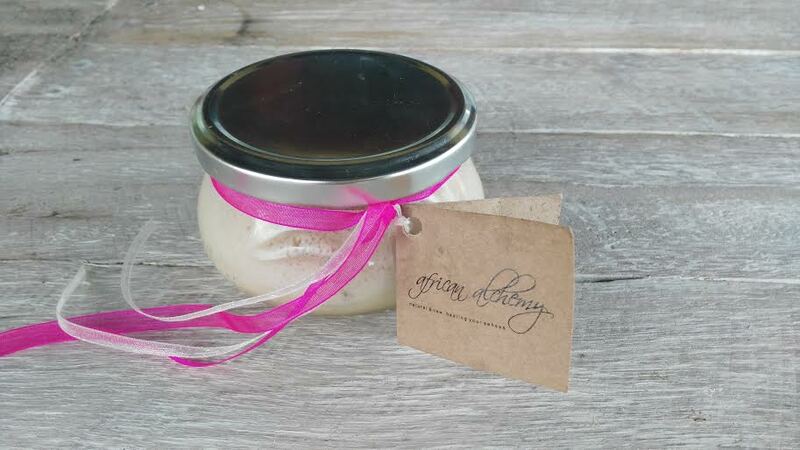 A tub retails for R120 and can be found at our local Paardevlei Farmers Market in Somerset West on Saturdays from 9am-2pm. Not only will you be in for a treat but you’ll also smell exactly like one, how sweet! !